Shake it to the right, shake it to the left, shake it all around… shake them booties to the pulsating beats of the Rainforest World Music Festival in Kuching city of Sarawak! The madness was here again with an adrenalin rush that would grip you and leave you spent, yet wanting more. I am talking about the contagious fever of the Rainforest World Music Festival, a well-known and much anticipated 3-day international musical extravaganza organized by Sarawak Tourism Board annually in the month of July. Held in the heartland of Borneo, specifically at the Sarawak Cultural Village in Santubong area, 35 kilometres from Kuching, Sarawak, the Rainforest World Music Festival is renowned for its diverse representation of world music. Tickets to the Rainforest World Music Festival were grabbed up so fast it would make anyone’s head spin. I was lucky to be allocated two tickets, valued at RM110 per ticket, sponsored by my company, and before you could say “Wonderful”, I had invited my best buddy to go with me. We did not attend the music workshops during the day due to work commitments, but we definitely went to the music performances that evening, a night you would not want to miss. Driving from Kuching City to the Rainforest World Music Festival pick-up point in Santubong took about 40 minutes, a bit longer as there was more traffic on the road. No private vehicles were allowed to drive directly to Sarawak Cultural Village; the main venue of the Rainforest World Music Festival located another 10-15 minutes drive away. From the pick-up point, we took the transfer coach, costing RM5 per person one way to the Rainforest World Music Festival. What a sight to behold… there were hundreds and thousands of people, milling and gathering around the entrances, surrounding compounds and stage areas of the Rainforest World Music Festival; and at a glance, more than half of the people there were overseas visitors. 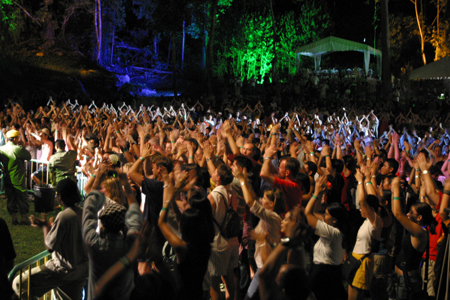 That was how popular and famous the Rainforest World Music Festival had become after its first inception in 1998, making this year 2011, its 14th year as the largest and most successful music festival event showcasing traditional, fusion and contemporary music from around the world. I briefly browsed the local handicrafts on sale at the Rainforest World Craft Bazaar held in conjunction with the music festival, but was not interested enough to buy any. On the other hand, the colourful range of ceramic pottery and ethnic-designed costume jewellery appeared to be hot items, especially with foreign visitors who presumably bought them as souvenirs. 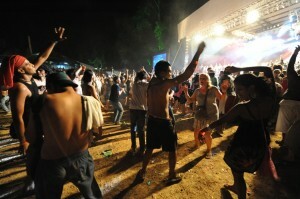 The Rainforest World Music Festival had evolved over the years to become a major social event, and that was part of its worldwide or international appeal, because where there were people of varied backgrounds, young and old, music, food and drinks, including beers and wine, all gathered in one place, there were bound to be plenty of merrymaking! This year, the countries where the music bands participating in the Rainforest World Music Festival, came from Australia, Canada, Dominican Republic, Eastern Europe, Finland, France, Iran, Italy, Kenya, Latvia, Malaysia, Mexico, New Zealand, Poland, Senegal, USA and Vanuatu. Of the 21 bands represented, the favourites were Frigg from Finland, Joaquin Diaz Band from Dominican Republic, and Lisa Haley and the Zydecats from USA. Malaysia’s representatives included Agungbeat from Sabah and Masters of Sape from Sarawak. All the bands were good but the fast exciting Afro-Caribbean merengue music by Joaquin Diaz of the Dominican Republic ruled the evening, as did the lively and energetic Louisana music by Lisa Haley and the Zydecats of USA. Lisa Haley is a grammy nominee who played progressive Louisana music in her own neo-traditional zydeco/Cajun style. The rhythmic beats combined with the intense atmosphere filled with diverse musical repertoire at the Rainforest World Music Festival were electrifying. Surprisingly, in the midst of the huge boisterous crowds, standing room only, we met a couple of friends, ready to party long into the night and have a funky great time at the Rainforest World Music Festival. First came the beers and after five rounds of “one-go”, my buddy was dizzy and feeling the effects of the alcohol. Fortunately I was the designated driver and only had two beers, sipped slowly. Next on the list were red wines and by this point, we decided it was time to leave and head homeward. We took the transfer coach back to the pick-up point and carefully drove back to Kuching. The ride back turned out to be longer than usual, as it was interspersed with abrupt stops for throw-up sessions by my buddy, about 4-5 times, I believe. I was considerably sober and looking forward to next year’s Rainforest World Music Festival and another unforgettable musical experience.